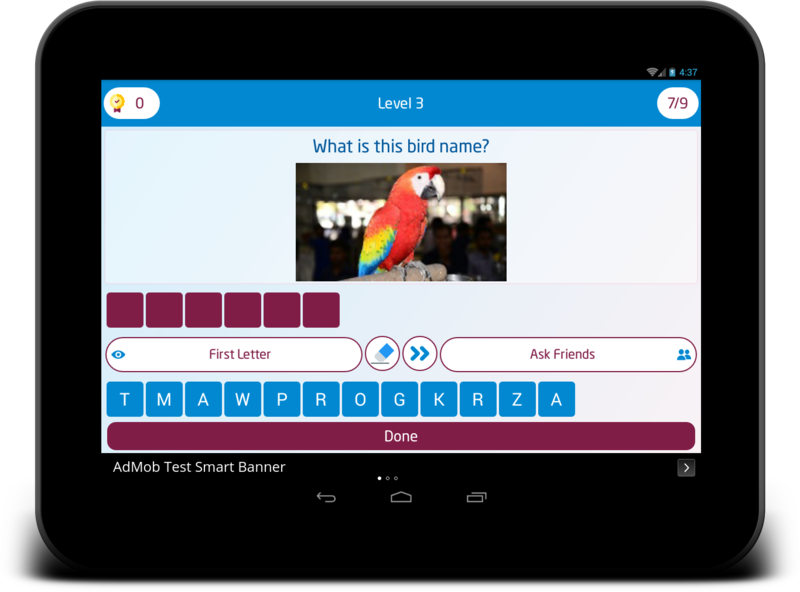 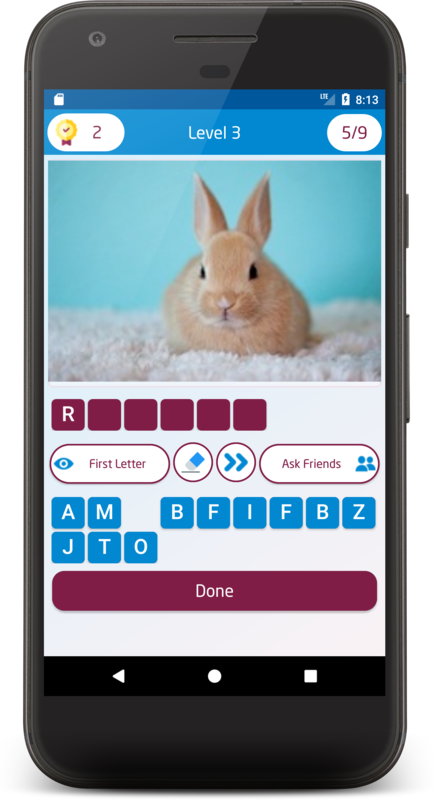 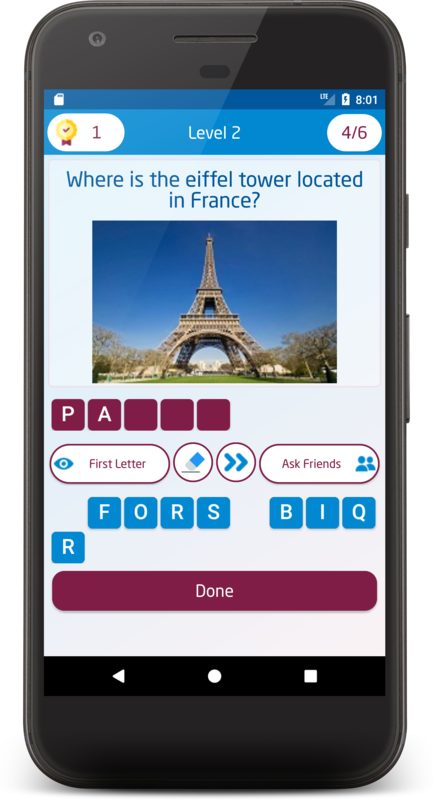 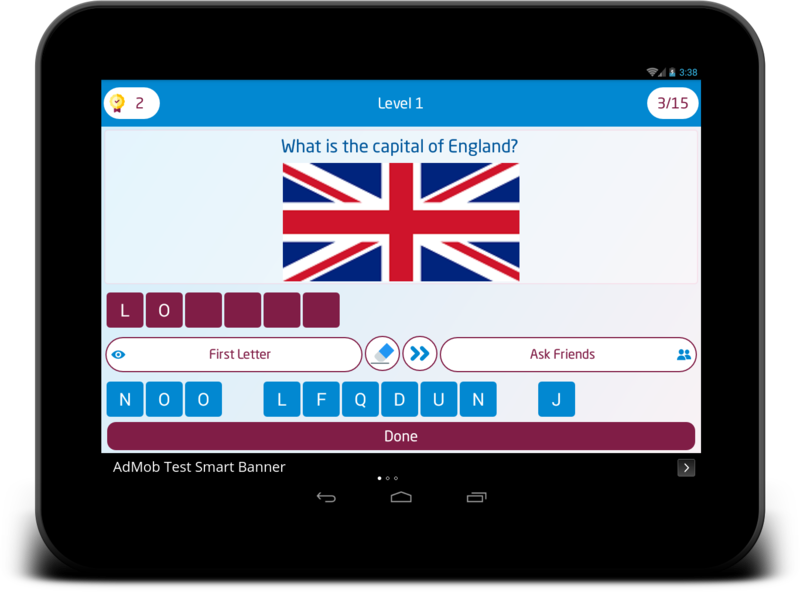 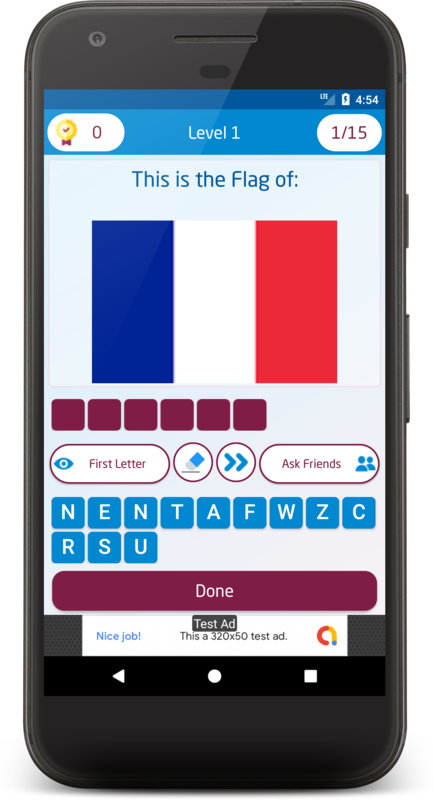 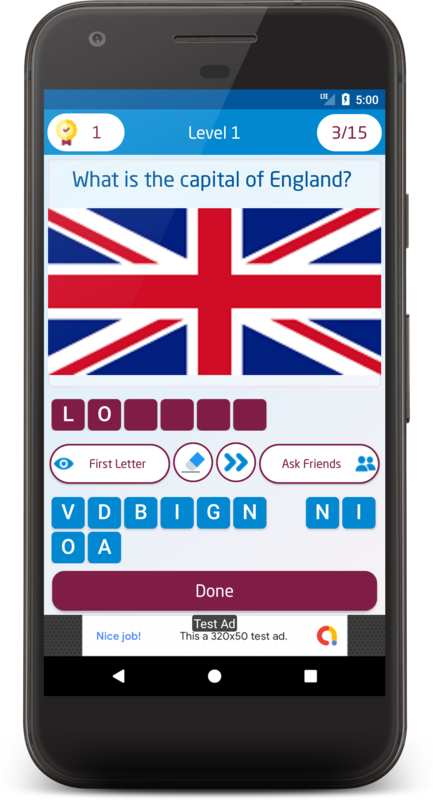 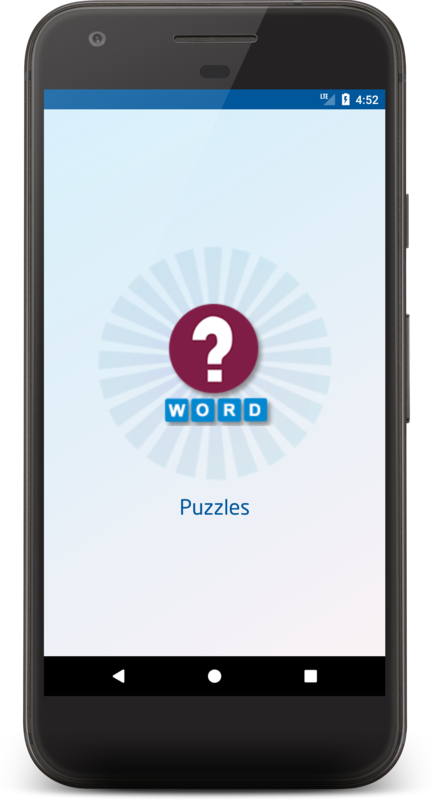 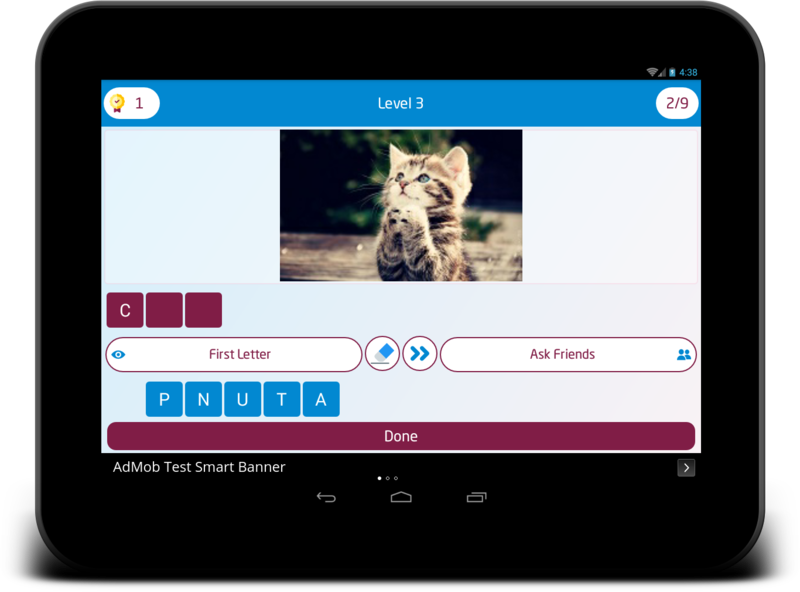 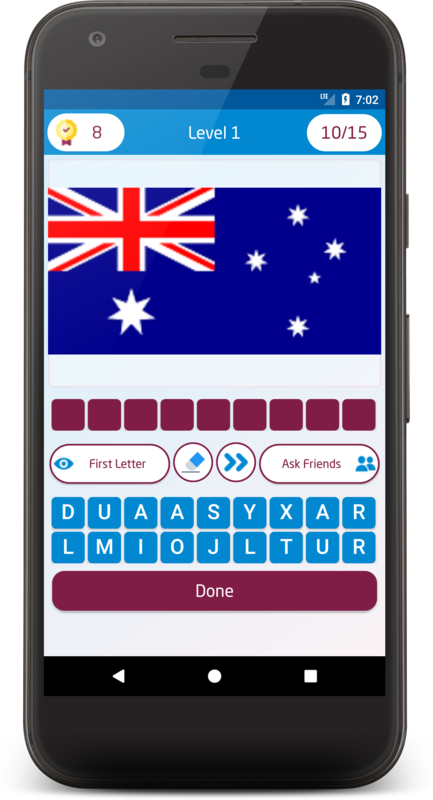 Offline Word Quiz – Image Guess Puzzle is an Android app lets you adding unlimited number of levels and unlimited number of puzzles inside each level, the puzzle can be inserted as text only, image only or text and Image with offline SQLite database. The app is integrated with AdMob Ads and In-App purchase to remove ads. 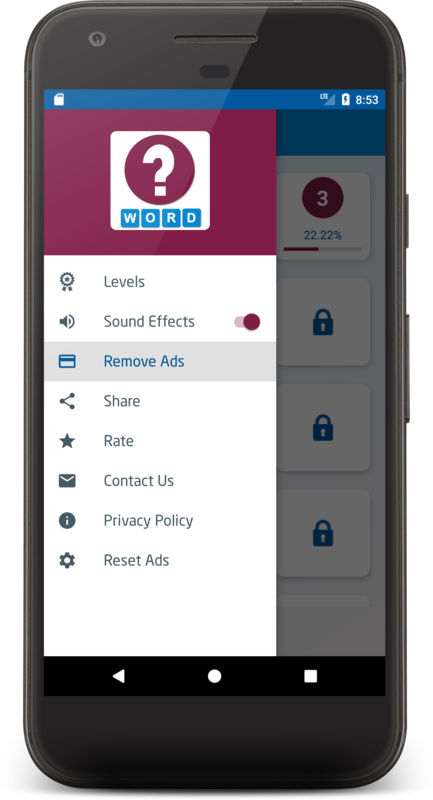 You can try removing ads feature by using the test APK which includes a free trial of In-App Purchase. 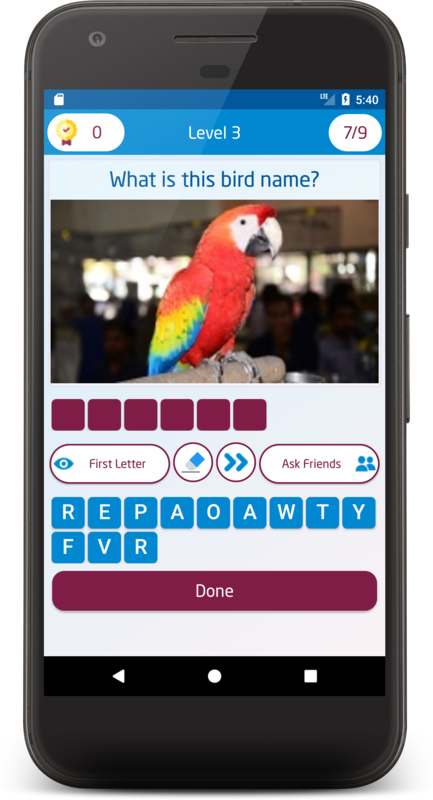 Offline SQLite Database with unlimited levels and unlimited questions for each level. 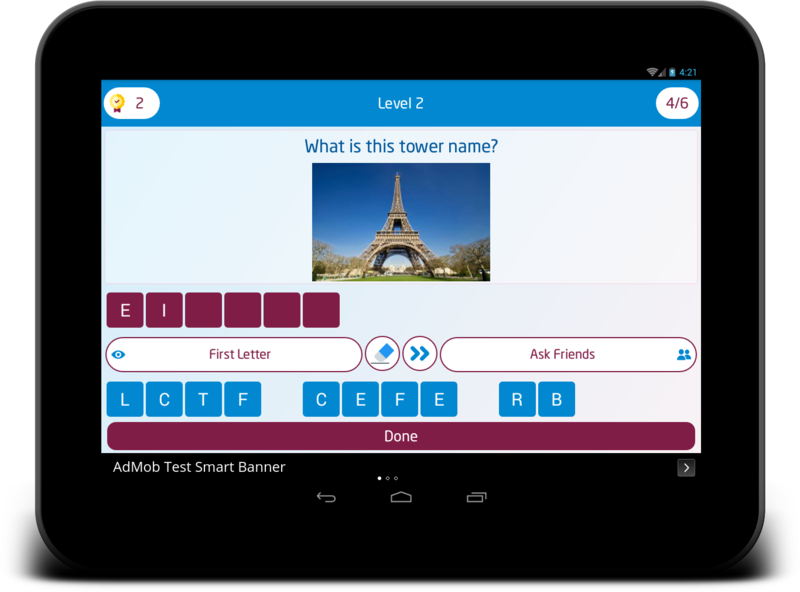 Ability to determine the number of levels easily. 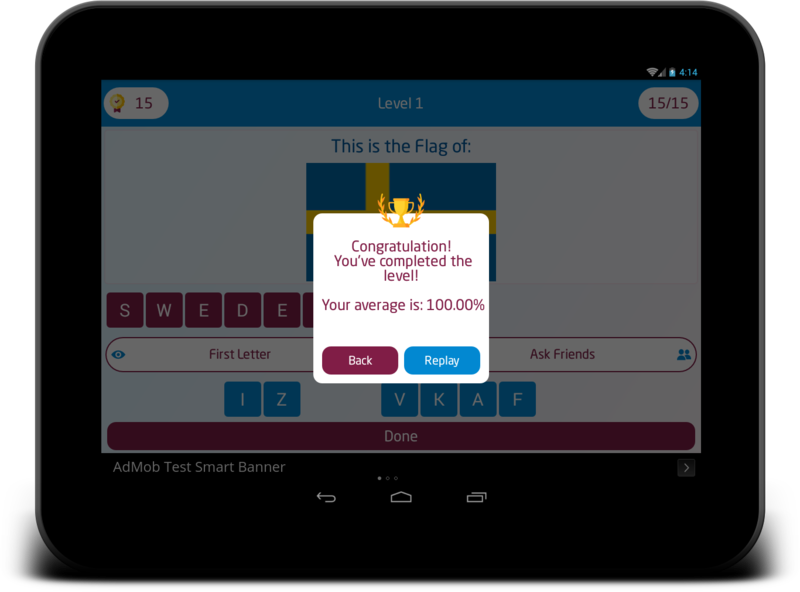 Show user progress and score average for each level. 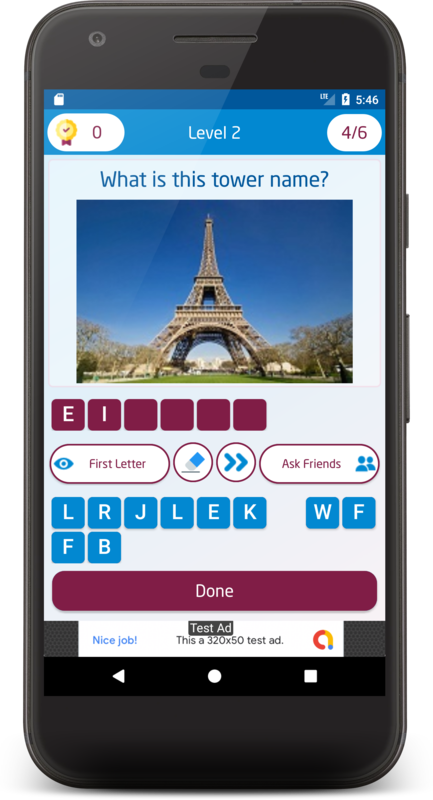 Flexible questions: Text, Image or Text+Images. 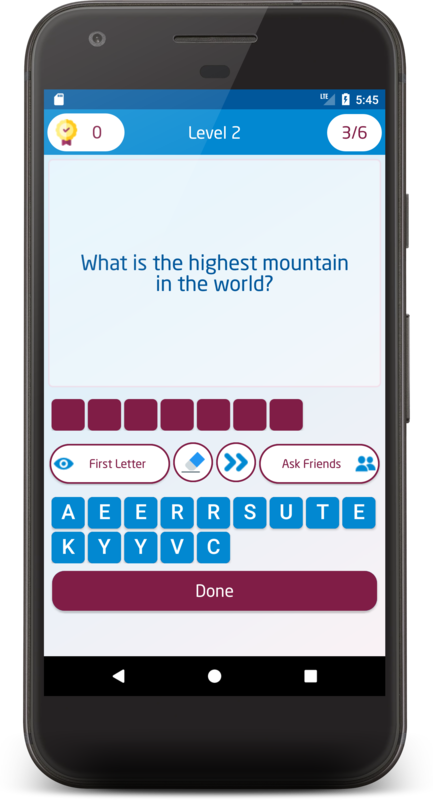 Ask Friends: Share screenshot of the puzzle on social media apps. 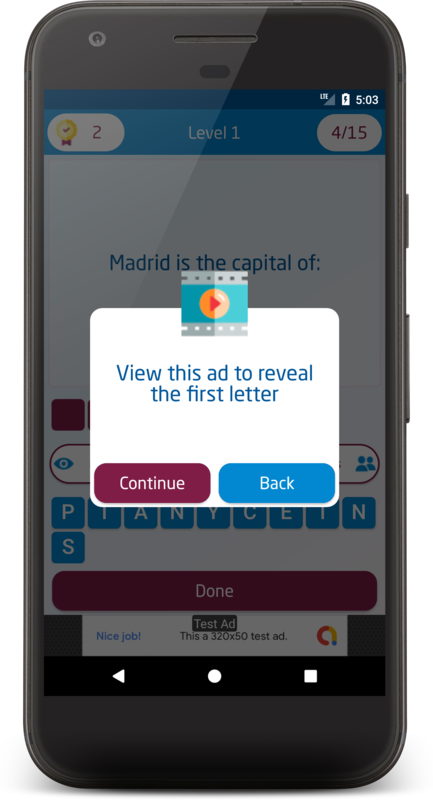 Reveal First Letter: After watching rewarded ad. 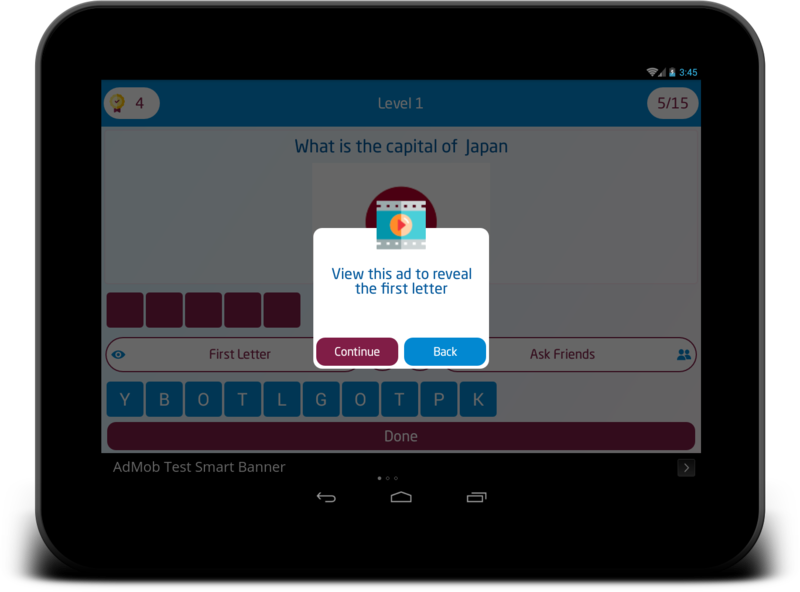 Multi popup dialog: (Correct, Wrong, Rest time to show rewarded ad, Reveal the first letter, finishing the level). 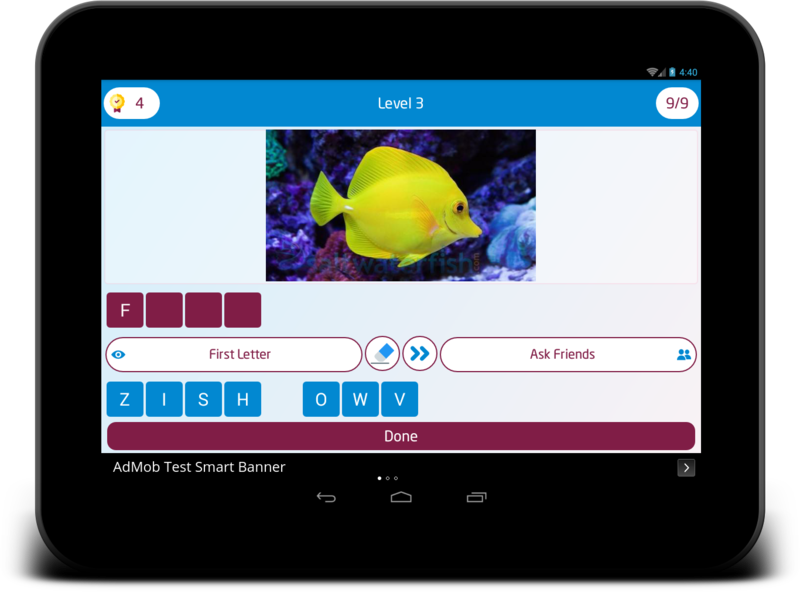 Responsive design, support Phones and Tablets and all screen sizes and orientations. Support LTR and RTL languages. 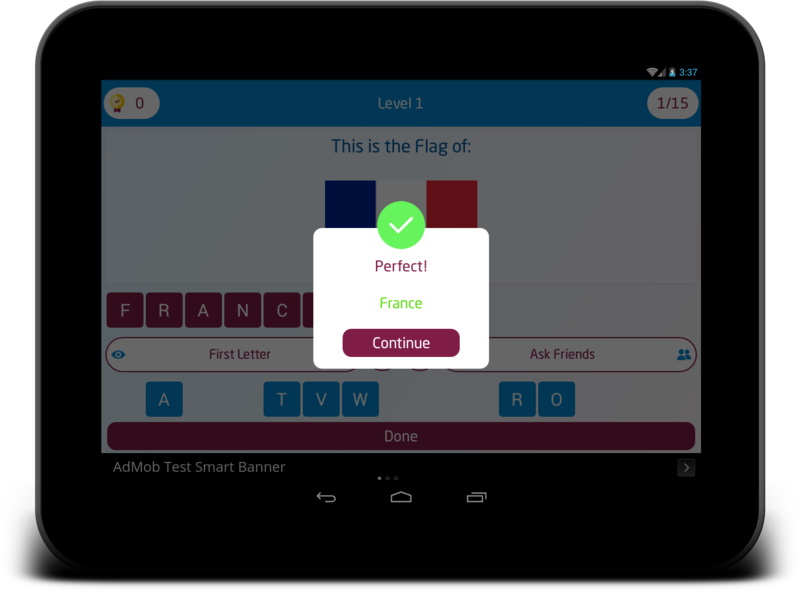 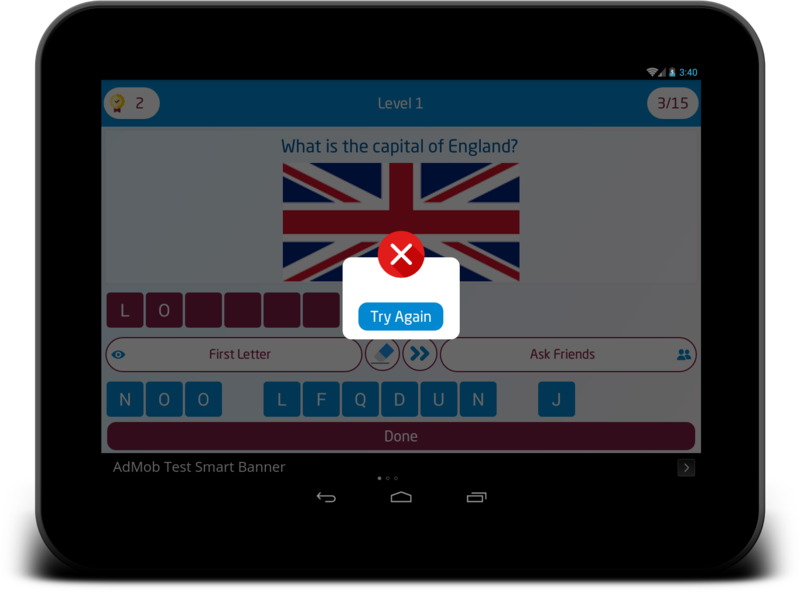 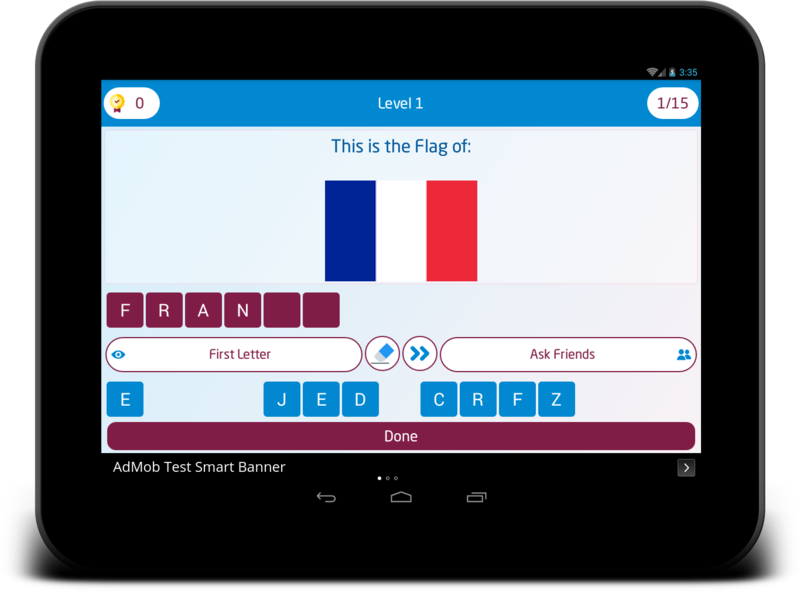 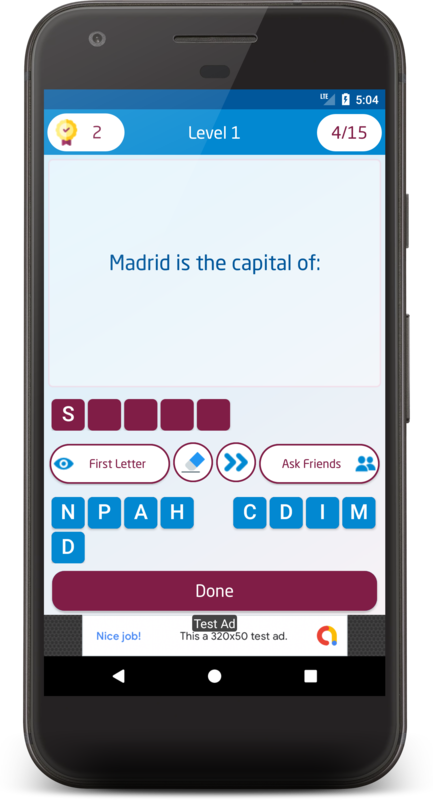 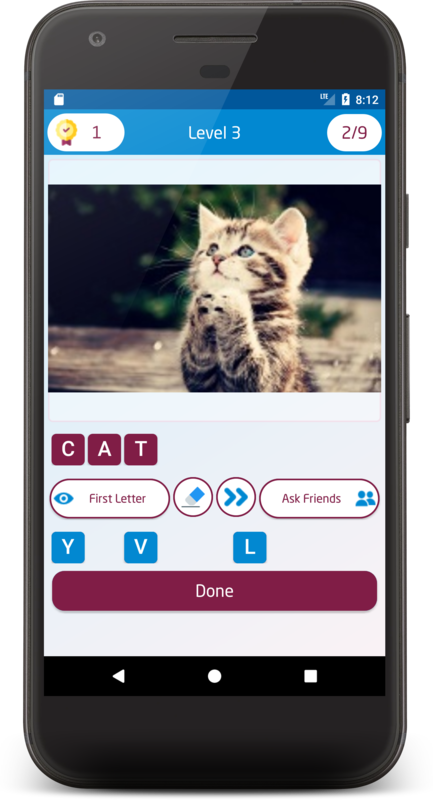 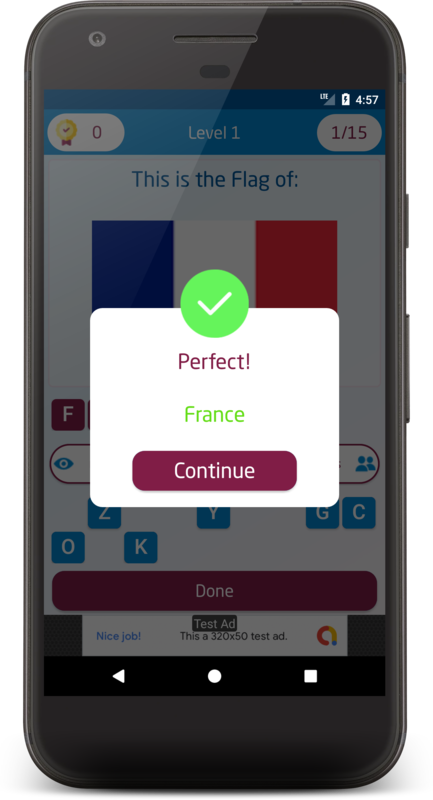 Ability to add any language alphabet to the answer choices. 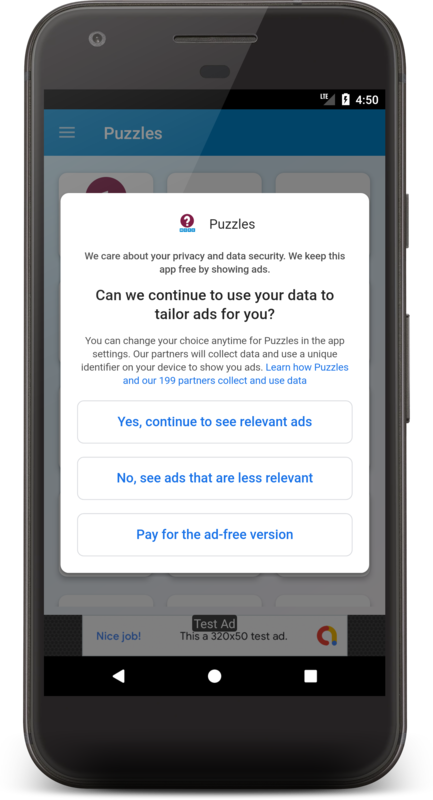 Integrating In-app purchase to remove ads. 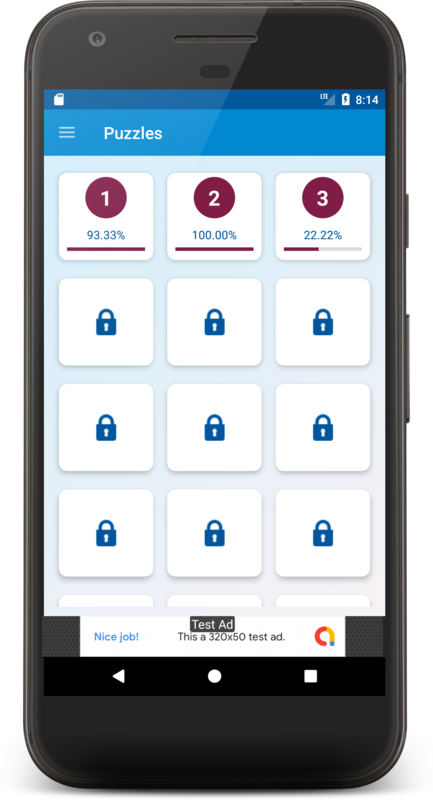 Ability to define a pass score average to unlock the next level. 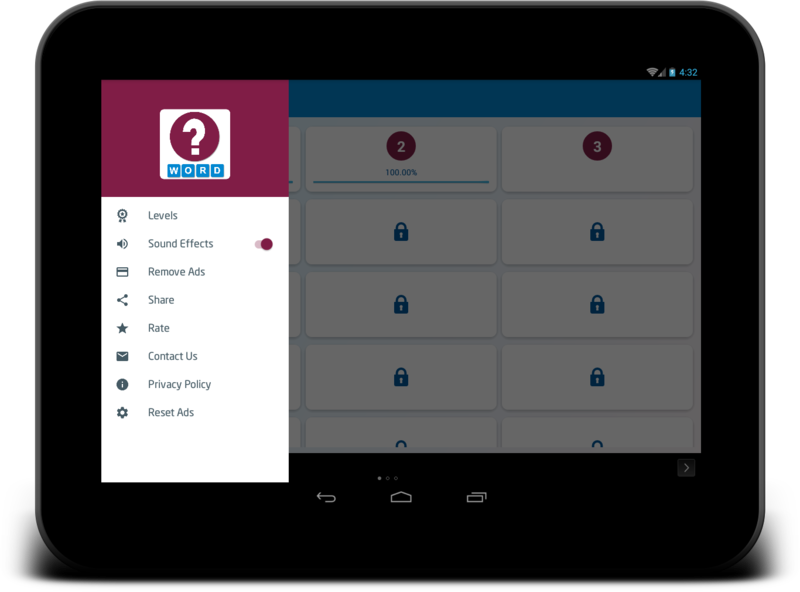 Skip Question: After watching rewarded ad. 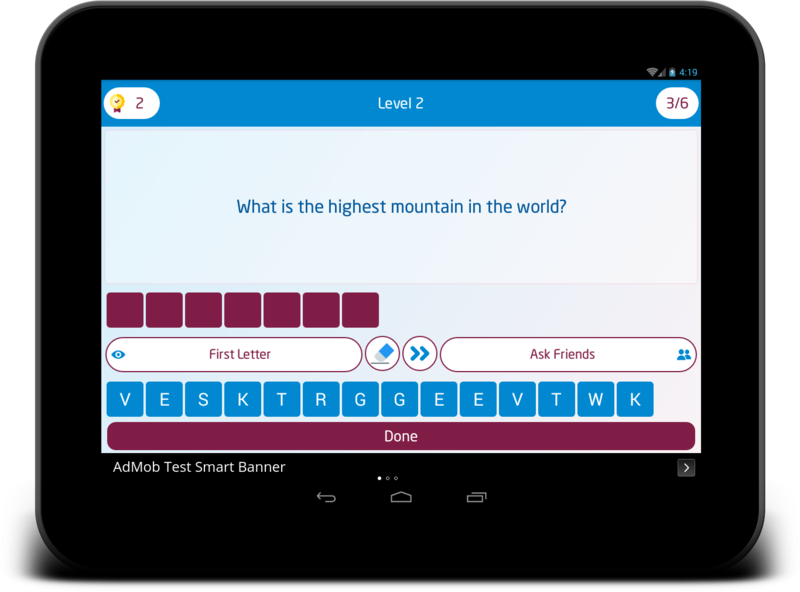 Consuming 1 score if answer is wrong. 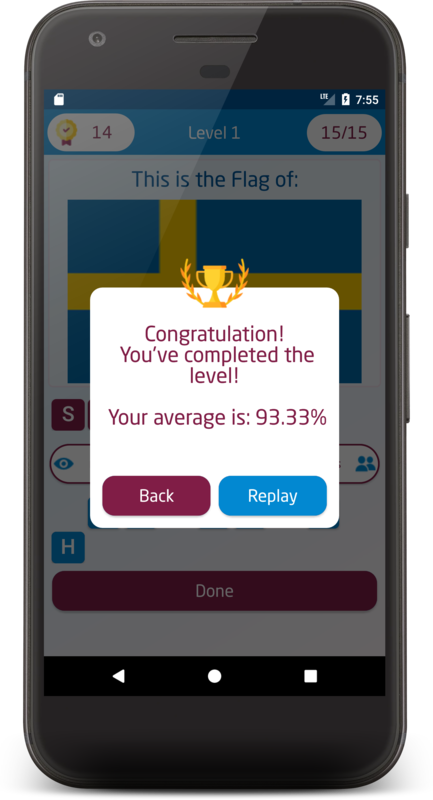 Ability to define the number of consumed scores if the user skipped question, with checking if player own enough scores to skip question. 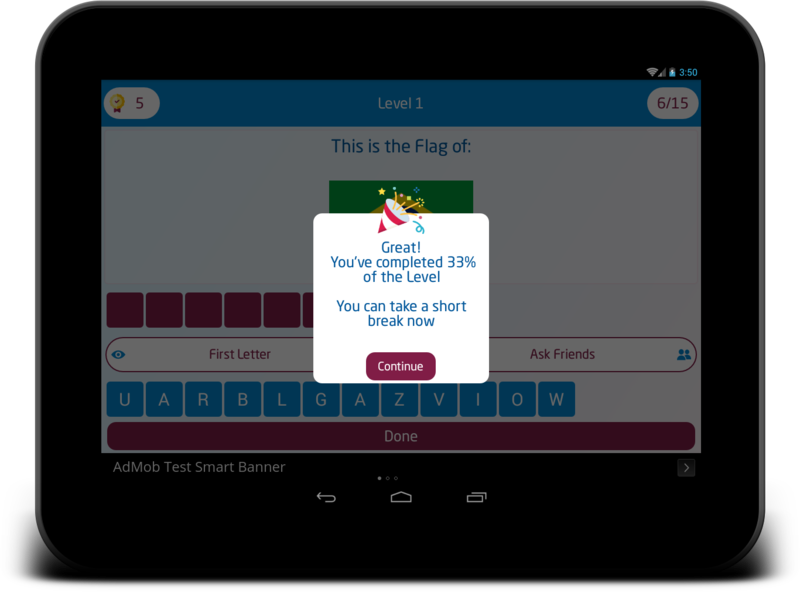 AdMob Ads (3 Types): Interstitial, Smart Banners, Rewarded video ads. 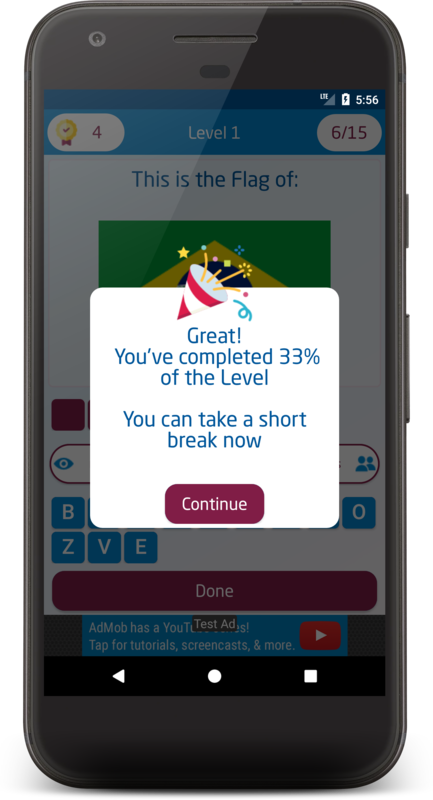 Rest Time: Showing rewarded ad every certain number of puzzles with progress percent, that number can be changed flexibly. 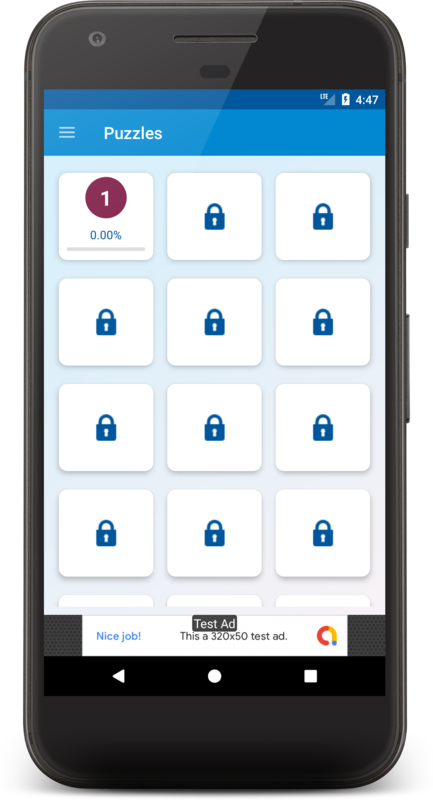 Support Firebase Push Notifications for active and inactive users (the notifications will be received when the app is working or not). 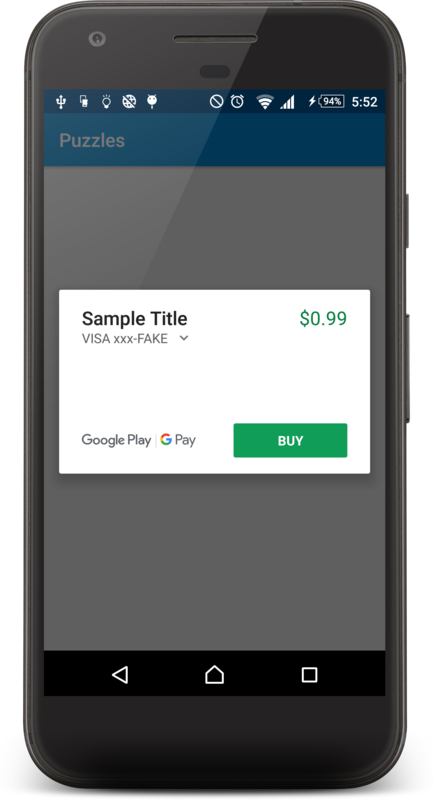 Android Studio project, Easy customization with clean code. 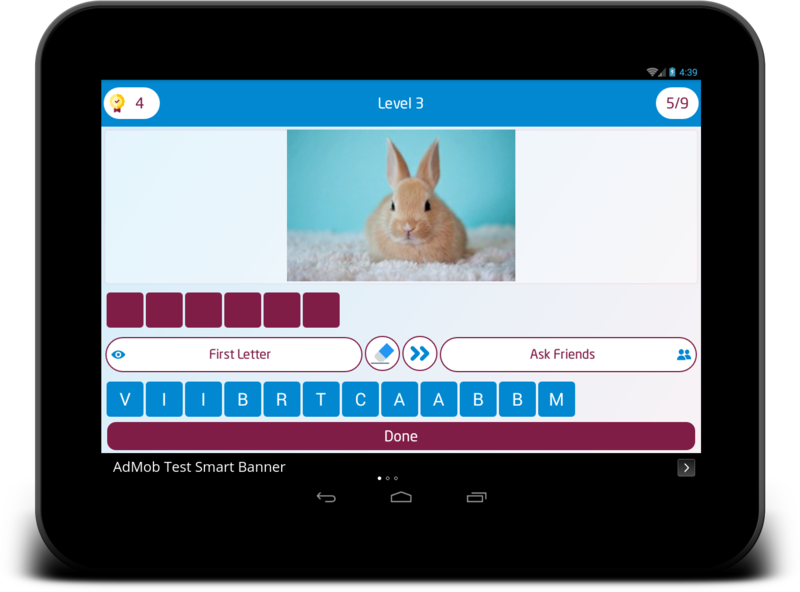 Documentation included with step by step guide . 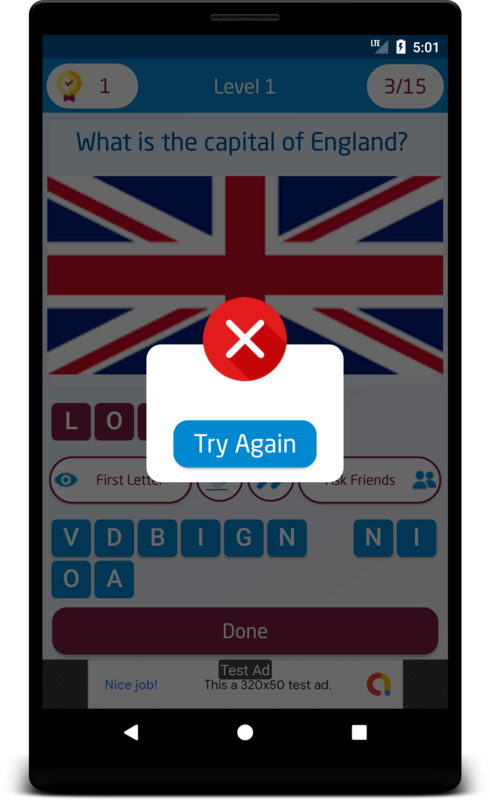 Fix error on android 9 pie. 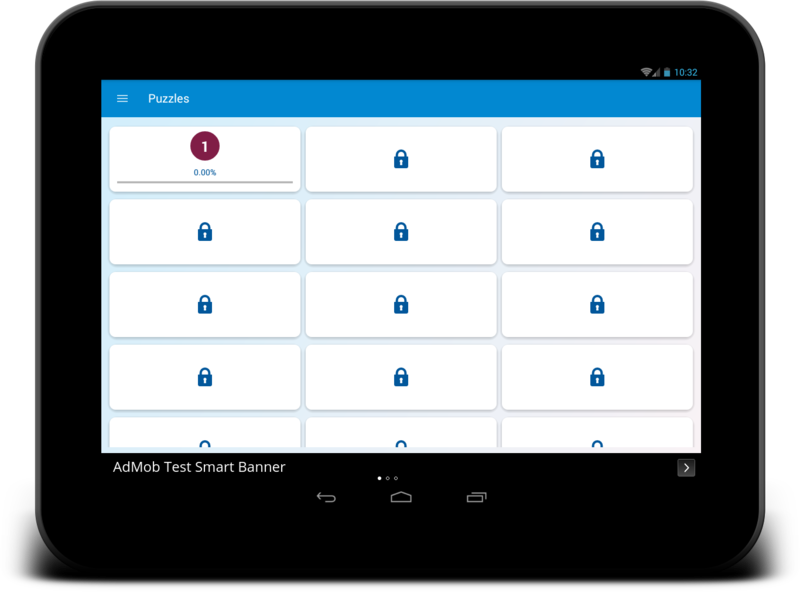 Integrate Firebase push notifications and analytics. 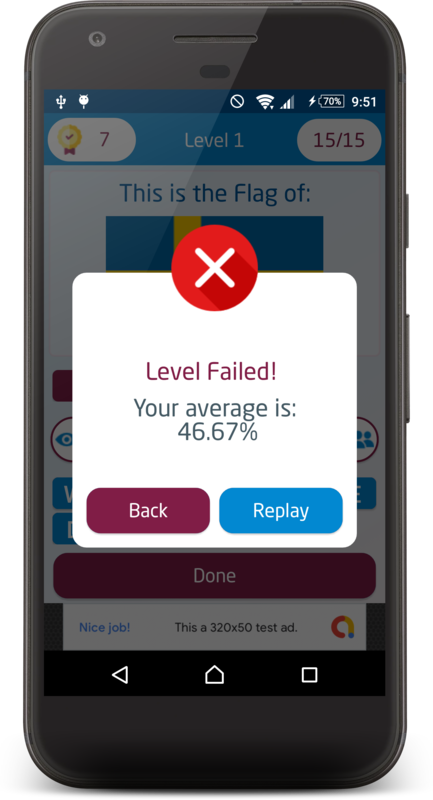 Ability to define the number of consumed scores for skipped question, with checking scores before skipping the question.